Bandaged with melancholic lyricism, raw tunes and battered emotion, The Yeah Yeah Yeah’s front woman, Karen O dropped her mesmerizing debut album earlier this week. Released on Cult records, the artist wrote the album when she was twenty-seven, between the years of 2006-2007. Karen O isn’t afraid to be herself; she creates music because it is her art. It is evident that her objective isn’t to sell, but to express and in Crush Songs we see Karen in her most human element, in a time in her life when her quest with love was anything but sweet. This album is comparable to Kathleen Hannah’s infamous Julie Ruin, a self-created project that was anything but processed but simply a raw, exposed and intimate part of herself put out to those who appreciate the realness of being in a seemingly superficial world. 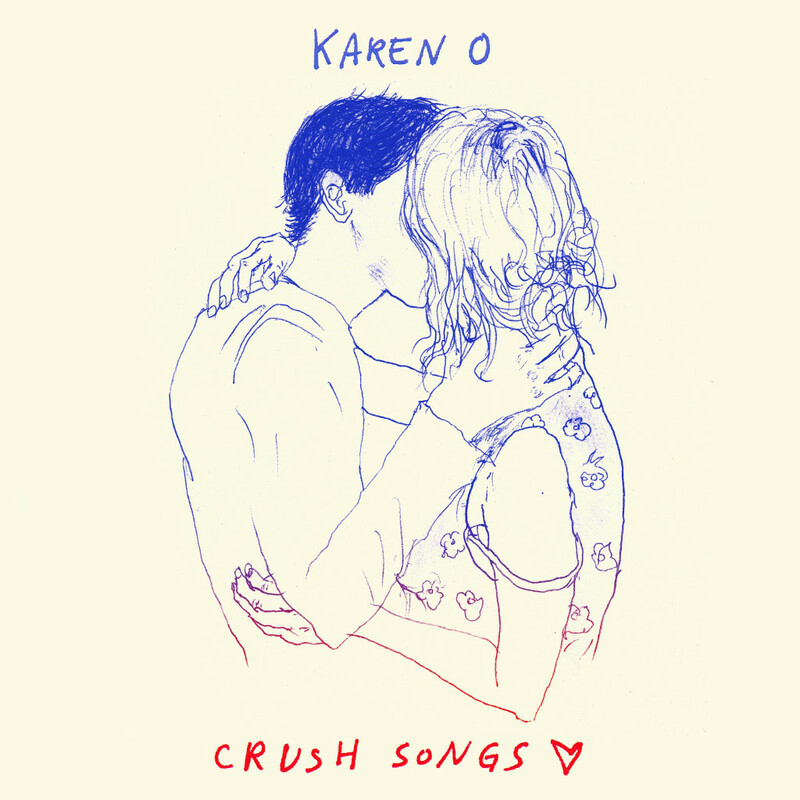 Crush Songs is work of art, to say the least, and highlights Karen’s pain and emotions in a wonderfully artistic and intimate way. Not even two minutes, this song is a relaxed acoustic, with hauntingly soothing lyrics. A nostalgic ode to a name that invokes many memories to the heart broken songstress. Rapt is a slow, tragic dream like ballad with bitingly sweet, yet sad lyrics. Like the music video, it makes one feel submerged underwater with its syncope-like musical elements. Visits is a raspy, raw tune with a distant, repetitive drumbeat that sings along nicely with Karen’s slow, and compelling vocals. With a very Lana-like sound, Karen sings masochistically about the harm her Beast and his love has done to her. Complete with a muffled acoustic and a side of her seductive vocals, this song is tragic, and wonderful work of art. With repetitive deep, calming acoustic strumming and vocal pauses, Comes the night appears to be almost like a short and chilling poem recorded on some kind of phone, great nonetheless, but extreme in the level of rawness. Following the same, short, sad melodies carried on throughout this album NYC Baby is a minute long ballad dedicated to the long gone lover. Other Side is yet another pleasant, scratchy listen with a bit more quixotic feel. So Far is a succinct, but incredibly heavy song that seems to drip with Karen’s emotions. A bit more upbeat than the rest of the songs, Day Go By, is a nice acoustic contrasted ironically with lost and depressive lyrics. Strikingly touching, this song is one of my personal favorites, not only does it offer lovely lyrics but also an unconventional musical approach towards the ending as Karen goes on a peculiar yelling frenzy. King is a soft and lovely tribute to Michael Jackson, the song references his infamous glove and trademark moon walk. It is quite poetic to say the least and carries with it some pretty interesting backing vocals. Rarely a minute long, this Door’s cover, is yet another pleasant and tranquil addendum to the hushed, artistic album it belongs to. A nice little number that will easily lull you to sleep, Sunset Sun is graceful and nicely composed melody. “growing up in these modern times ain’t easy” the singer speaks in the beginning of this song, if anything Native Korean Rock is about realization, a song that pretty much wraps up the heartbreak and concludes with some advice to anybody out there suffering from the punches of love. the final song, literally a singalong, it closes the album pleasantly with a sweet, whimsical note.